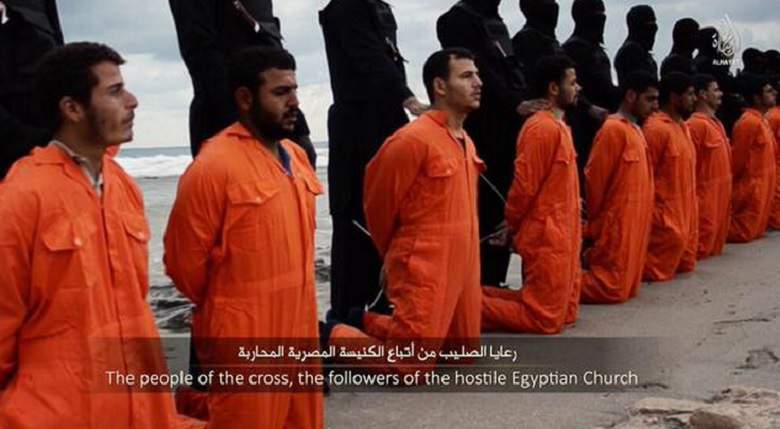 ISIS-linked militants post video of mass beheadings of 21 Coptic Christians in Libya. 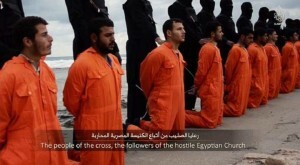 International Christian Concern (ICC) has condemned the brutal killing of 21 Egyptian Christians by militants in Libya claiming affiliation with Islamic State. A video released on Sunday by the media arm of ISIS purports to show the beheading of a group of Egyptian Copts who were kidnapped in two separate incidents in the Libyan city of Sirte in December and January and had been held hostage for weeks. The savage five-minute video is filmed in a style similar to that of previous videos depicting the murders of Western prisoners by ISIS, who have overrun large parts of Iraq and Syria. In the video, the captive men dressed in orange jump suits are made to kneel and one militant, dressed differently to the others who are in black, addresses the camera in North American-accented English. “All crusaders: safety for you will be only wishes, especially if you are fighting us all together. Therefore, we will fight you all together,” he said. The captive men are then laid face-down and simultaneously beheaded near a beach in Tripoli. Egypt’s state news agency MENA quoted a spokesman for the Coptic Church as confirming that the 21 Egyptian Christians believed to be held by Islamic State were dead. Thousands of Egyptians have travelled to Libya in search of jobs since an uprising at home in 2011, despite advice from their government not to go to a country sliding into lawlessness. Egyptian President Abdel Fattah al-Sisi has called a seven-day mourning period and an urgent meeting of Egypt’s top military commanders. International Christian Concern (ICC) spoke to Kerolos Fayez, the brother of Mina Fayez, one of those taken captive in Libya. The family was in shock and deep mourning as their worst fears were confirmed in the video. “We mourn alongside of the families of those who have been killed, along with all Egyptians who saw their countrymen brutally killed, and with Christians around the world,” he said. “The international community must continue to take swift and decisive action to see that those who are responsible for this violence are brought to justice,” he warned. The Coptic Church said it is confident the Egyptian government in Cairo will seek justice. Al Azhar, the centre of Islamic learning in Egypt, said no religion would accept such “barbaric” acts. Libya is caught in a chaotic power struggle between two rival factions operating their own governments, and in this context Islamist militants are taking advantage of the turmoil to strengthen their presence. A number of Islamist militant groups have been active since the fall of Muammar Gaddafi in 2011 left Libya without a strong central government. A few have declared ties to the radical Islamic State and claimed high-profile attacks over recent weeks in what appears to be an intensifying campaign.